Part of its appeal for journalists: if your raw data isn’t in a Google Fusion-friendly KML file, you don’t have wait for someone else to do it or find another source. (The US Census Bureau, that treasure trove of maps, offers exports of their data in shapefile format.) You can import it in QGIS “get rocking and rolling” with the analysis De Groot says and then export in KML or SVG formats if you need to. The class was the last installment in a four-part series of free data workshops for journalists – you can check out webcasts online here. 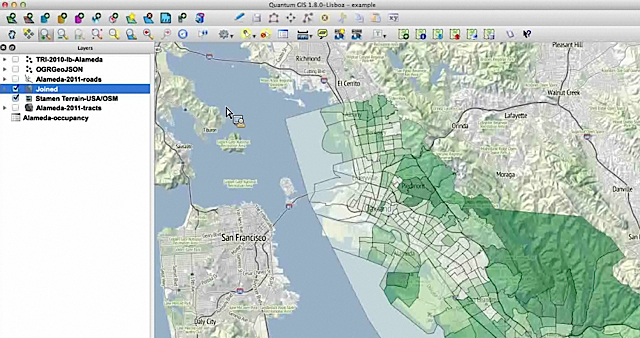 He walked through some maps with US census data – with a few clicks he created detailed map of Alameda county and overlaid it with Stamen’s terrain maps for the above example. Neat, right? I’ve taken a few KDMC data classes online and in person, and always find De Groot’s hands-on approach helpful. He’s that mild-mannered guy from the design department who brings up some objection that seems useless but let him have it his way, whatever – then you see your story live and invite him for drinks to apologize. Up next for me: slogging through the KDMC QGIS basics tutorial. This entry was posted in data and tagged free software, KDMC, Len De Groot, maps, QGIS, Quantum GIS, Stamen, tools by . Bookmark the permalink. Thanks – a little over my head but at least a good intro and I can poke around to try to figure it out.